The sports channel TyCSports of Argentina, opened in the Plaza Mayor Torcuato de Alvear in Recoleta Barium Buenos Aires, three statues honoring three great representatives of soccer. Lionel Messi, Diego Armando Maradona and Gabriel Batistuta as of today, they have their tribute. 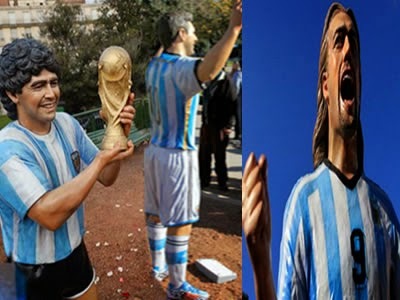 According to sport, each of the figures were Fernando Pugliese sculptor who designed a young Maradona lifting the World Cup, Messi celebrating goal with dedication to his grandmother and Batistuta celebrating being the top scorer of the Argentina. The statues have been a way of remembering and preserving the collective memory of the characters that have represented a country through soccer. It is a creative way to glorify the legend of the sport, although many of these monuments have been made in life, many others have been built before the players retire.